Just a solitary man on a horse, making their way through a sandstorm in the desert, is already such a lonesome image. The desolate landscape provides an isolation of the body and the soul all at once, battling the elements with no living soul or end in sight. Except for death. Death is all around. First, his horse dies. He truly is a man alone now. Then, he encounters a rattlesnake, poised to kill him. The first sign of life, yet signifying death and doom. The doom of loneliness, until death claims the man. Death surrounds him. He kills the snake. Then, finally, people! Except they turn out to all be dead already, violently murdered. Just bodies in the dust now. The man remains alone. Yet, he doesn’t become truly isolated until he (re)enters civilization, in the form of a small town. Before he gets a chance to speak to another human being, he is accused of the murder of the people whose bodies he came across in the desert, and forced to defend himself. His first real palpable interaction with another still living person is through a bullet, mirroring his encounter with the rattlesnake. After which he has to hide in the shadows, while the citizens hunt him down. He is amongst people now, but even more isolated than before. From these shadows, he has to witness more murder, of which he is also accused. Wasn’t he better off among the vastness of sand and rocks? At least the snake attacked from the front, not the back. Or with lies and slander. He does find one intelligent, lonely soul to connect with, who’ll believe in him and not in the accusations that have turned into a witchhunt by a posse. The two of them become isolated together. 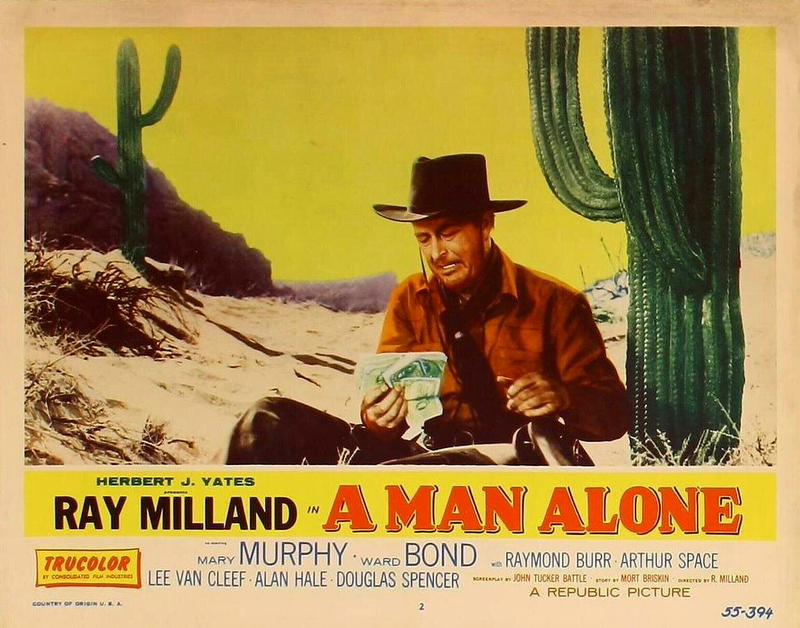 As the hunt continues, Ray Milland’s 1955 directorial debut A Man Alone (in which Milland also stars) turns into one of those neat western parables for McCarthyism, like Silver Lode (1954) the year before it. Similarly, A Man Alone has a noirish feel to it at times, especially during the man’s desert journey, with all the high contrast night scenes. Afterwards, as the town turns against the man based on false accusations and on his reputation as a gunslinger, most of the film takes places in the glaring sunlight of dusty daytime. The man remains isolated from his fellow men all the same, through prejudice, mistrust, and fear. It doesn’t end there, as there’s nothing a gunfight and some repeated straight talk can’t fix, but the earlier atmosphere and images linger.